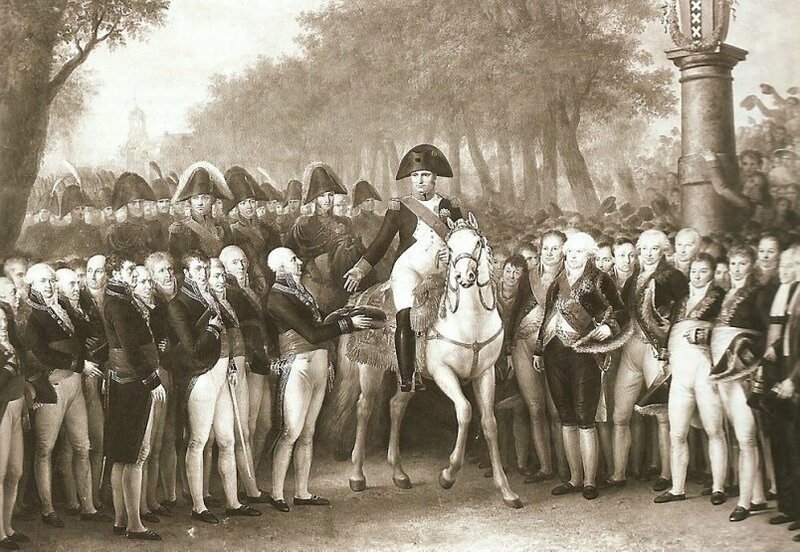 The entry of Napoleon into Amsterdam by Matthieu van Bree (painting finished in 1813). 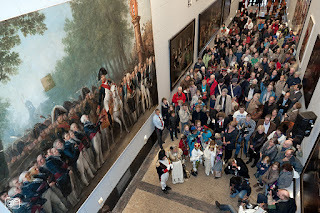 Last week it was exactly 2oo years ago that Napoleon visited Amersfoort. I’m still searching for more info about this visit, meanwhile a painting of his visit to Amsterdam, Sunday October 9, 1811. It is one of the largest paintings in the Netherlands (20 x 13 feet). It is currently in restoration while on display in the Amsterdam Museum. The painting in the Amsterdam Museum, notice the lookalike (photo nu.nl). I did notice the lookalike. I also noticed the soldier lady carrying the tiny soldier behind the man in the red jacket. But I think most curious of all are the giant set of legs to the rear of the crowd. You Dutch sure are tall. What a magnificent size! Where was it originally displayed? The hallway here seems too narrow to give it justice. It was on display in the presence-chamber of the old city hall. It moved to the Rijksmuseum (the national State Museum) in 1885, where it was rolled up and shelved in 1891.